This is the 60' (15") observation car from the MTH 6109 set. The cars use 2 type 1445 incandescent bulbs to illuminate silhouette style windows. The 2 red marker lights and the above door white/clear signal light are barely visible even at command track voltage. This is because these 3 lights are simply lenses that attempt to capture the interior lights from the bulb. I replaced the 2 bulbs with warm-white LEDs using the now popular and reasonably priced 12V LED strips. 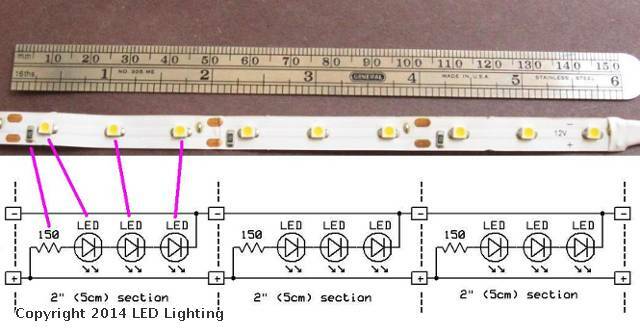 There are various versions of these strips but a common type operates at 12V DC and is a repeating set of 3-LEDs on 5cm (2") adhesive backed sections. If you buy a 5 meter strip, you get 300 LEDs on 100 5cm sections of 3 LEDs each. 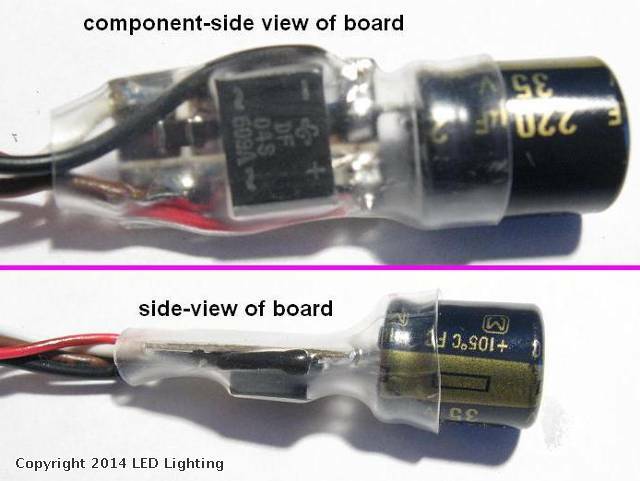 The cost is only 2 or 3 cents per LED from eBay or Amazon! 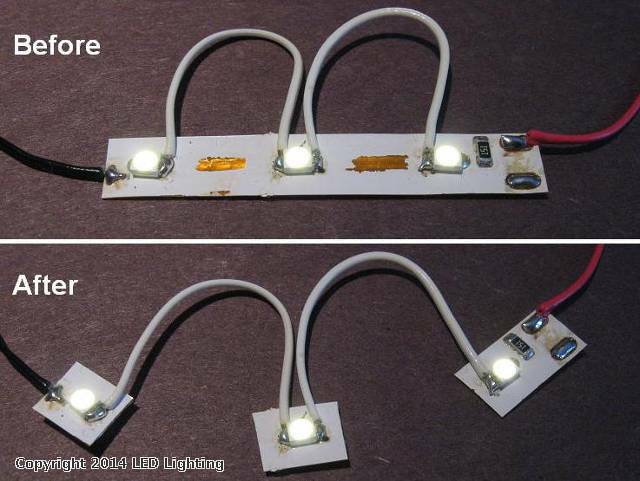 The strips start to light (dimly) at about 7-8V DC and reach nominal full brightness at 12V DC. 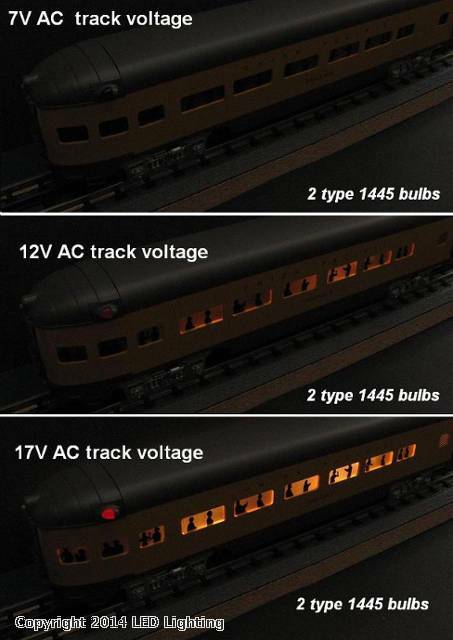 So the task is to generate a regulated/constant DC voltage starting with the varying O-gauge track voltages. One approach is to use off-the-shelf DC-to-DC converter modules. These are less than $2 on eBay and can be adjusted via a screwdriver trimpot to set the output voltage. 3 additional components, with soldering required, make these modules work with AC track voltages. A 22 uH inductor makes this compatible with MTH-DCS command control. A bridge-rectifier makes performs the AC-to-DC conversion as the modules require DC input, and a electrolytic capacitor provides energy storage to demote flickering due to dirty or intermittent wheel/roller contact. The first task is to access the track voltage. In this case the bulb bayonet style sockets were fastened to the chassis itself so there were no wires to access the outer-rail voltage. A wire was soldered to one socket. 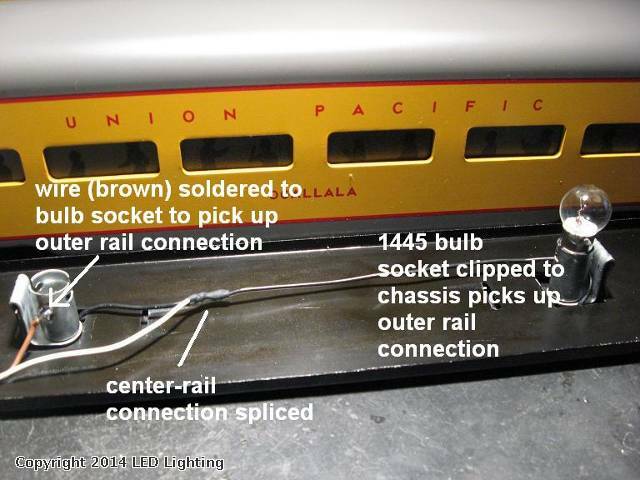 The other voltage (center-rail) was accessed by splicing the wire that connected the two bulb sockets. There are various types of DC-to-DC modules; in this case a so-called "buck-boost" module was used as this can generate a regulated output voltage irrespective of whether the input voltage is below or above the desired output voltage. This means both conventional and command voltage operation is supported...as well as both AC and DC. 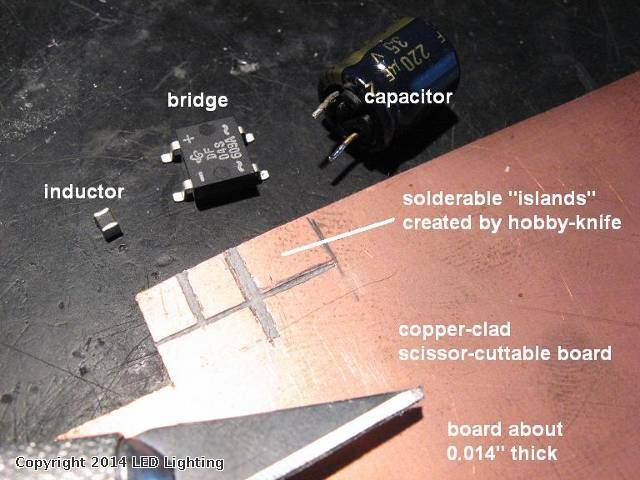 One assembly technique is to use copper-clad, scissor-cuttable board. Using a hobby knife, small islands of copper are created to create a surface to mount and solder components. Heat shrink tubing covers the 3 components and the 2-wires in (track voltage) and 2-wires out (unregulated DC voltage). 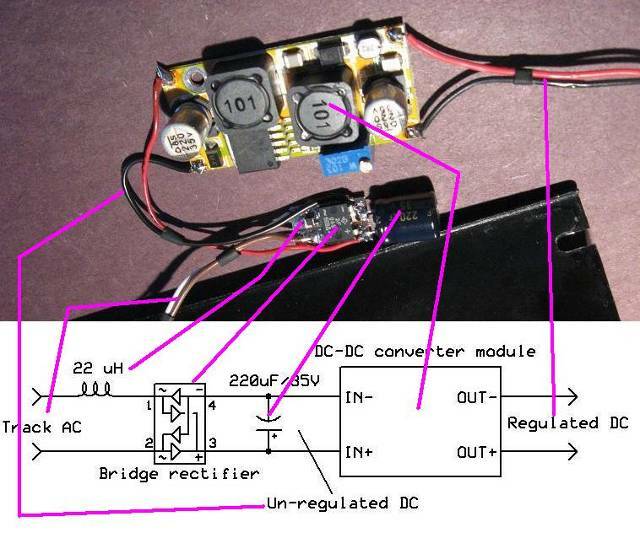 The DC-to-DC module was set to 9V DC as this provided suitable brightness. 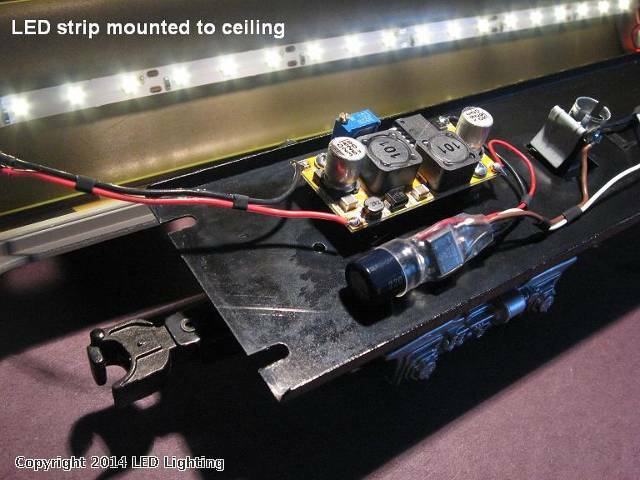 18 LEDs or 6 sections (6 x 5cm = 30 cm or 12") were attached to the ceiling. A 2-pin connection was used between the DC-to-DC converter module and the LED strip. 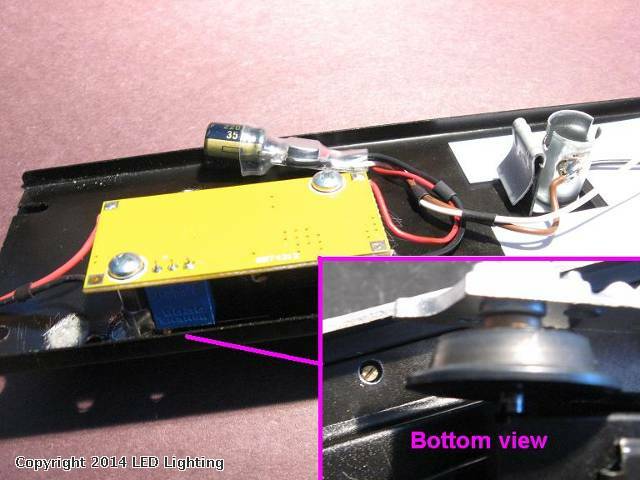 To allow brightness adjustment, the regulator module was mounted upside down and a hole drilled on the chassis to access the screwdriver adjustment. Obviously this can't be done with the car on a track so the adjustment has to be done with alligator-clip jumpers or the like attached to the center-rail power pickup and outer-rail wheel. To handle the 2 red markers and white signal light, a single 5cm/2" LED section was modified to provide 3 discrete white LEDs. Wire jumpers were attached between the LEDs and then the strip was cut. The 3 LEDs with then glued (epoxied) to the existing lenses. 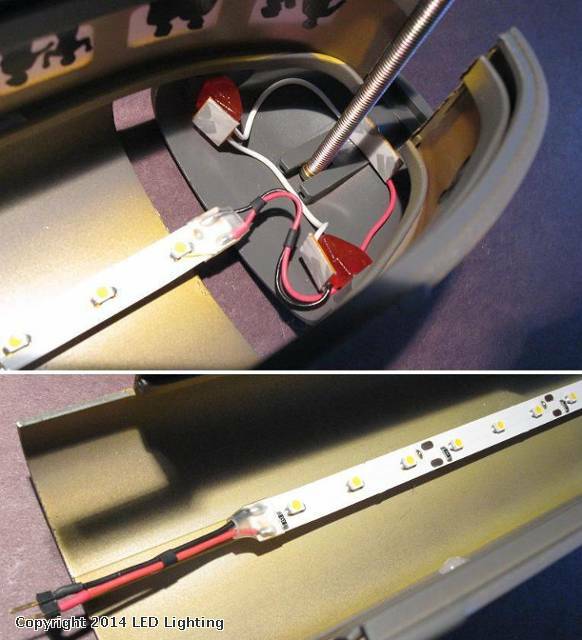 These 3 LEDs are electrically just another 5cm/2" section so they are powered from the LED strip itself. This makes a total of 18 interior, 2 marker, and 1 signal = 21 LEDs. Now the car operates at constant-brightness across the full conventional/command track voltage range including both DC and AC operation. With the DC-to-DC module set to 9V, the current draw of the 21 LEDs was about 20 mA total or less than 1/4 Watt. The DC-to-DC module itself requires power but the total power to the car was about 1/2 Watt irrespective of track voltage. In contrast, the 2 type 1445 incandescent bulbs required over 5 Watts at command voltage; and even drawing 10 times the power, it was not as bright as the LED system. Stan I never get tired of seeing your excellent work. I also really appreciate how much effort you go to in order to show us how to do these great projects. I learn greatly from these - thanks so much for posting! First thank you for sharing your knowledge on this project, I have some questions. 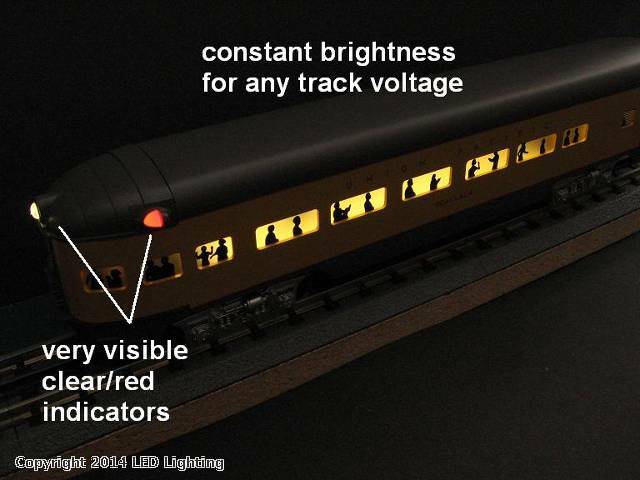 I have MTH RailKing New York Central - Dreyfuss passenger cars that I would like update the light to your system. I would like to know more about the parts. I know how to use soldering iron and to read blue prints but I am still a beginner when it comes to electronics. Can you please post a list of the parts and company that makes the part and where you got them from. I hope I am not violating any rule by asking but where you got the parts from. Any additional information you could supply would be greatly appreciated. Take a look at some of the LED related threads there where active links (such as to eBay) are given for components. As an archive, I'm a little weary of providing links here which become out-dated. If you start a topic there stating what you're trying to do or joining in to an existing thread, there are several guys (my ID there is stan2004) who will help. What's really useful on OGR is there are others who are also beginners at electronics who bring discussions back on course when they drift off into techno-babble! That said, if for whatever reason you don't want to use the OGR forum, we can try to get your project off-the-ground here. I went to the O Gauge Railroading Online Forum and got the information I need that I needed, thank you.